The recent earthquake in Napa has put the Napa Valley Wine Country in the news. I have always thought of this part of Northern California as part of the original “wine country.” There is so much to know and tell about this area of California I can only cover a small part. There was a commercial for a wine maker many years ago, where a little cartoon guy says their wine is from “sonapanomamendocino.” This was meant to be a funny combination of the names of the three original wine-producing counties in Northern California, which are Napa, Sonoma, and Mendocino. There are several sites of old wineries called ghost wineries. Some have been refurbished and opened under new names. Freemark Abbey on Highway 29, a short distance from downtown St. Helena, is one. There used to be a candle factory located on that site as well called the Hurd Candle Factory which is sadly no longer there. Hurd specializes in beeswax candles and you could watch them being made at the old factory. Their store is now located in Calistoga, Ca. but you can not longer watch the candles being made. 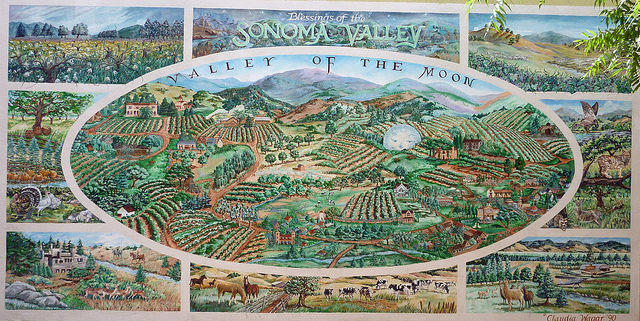 Located in Sonoma County, Sonoma Valley or “The Valley of the Moon” is a beautiful part of the wine country. There is controversy about where its name, Sonoma, originated. It is often attributed to the early indigenous people’s word for “many moons.” As the moon rises in the valley it can be hidden behind the mountains and appear to rise again several times. Thus, the name “many moons.” Jack London had a home in the Sonoma Valley in Glen Ellen. One of his books is ” The Valley of the Moon.” Who wouldn’t want to be in the Valley of the Moon, how beautiful. The name stuck. The city of Sonoma has a large main square that is great for walking with a park, shops and restaurants surrounding it. It is the birthplace of wine growing in California and the birthplace of the state of California. Sonoma was founded as a Spanish Mission and was under Mexican rule. The Bear Flag Rebellion occurred there when some of the people wanted California to be part of the United States. That is the reason for the bear image on the state flag of California. We stayed in Sonoma this past Christmas. The city has a small town feel. We could see a lot of stars at night as there is not a lot of city light to cloud the view. Sonoma is conveniently located for touring around and visiting a winery. A favorite thing for me is to buy a delicious crusty baguette, some good cheese, dry Italian salami and some Greek olives with a bottle of wine and have a picnic lunch. We did that at a nearby winery, Benziger, in Glen Ellen. We had a fun tour of the winery pulled along in a tram-car behind a tractor. The winery is in a gorgeous location on Sonoma Mountain. Today California’s wine growing regions cover many parts of the state. There are wineries from San Diego to Humboldt counties. When I travel up the 101 Highway I can see a lot of land from Santa Barbara to Paso Robles has gone to vineyards. If you have seen the movie “Sideways” you know a little about the wine region in the Santa Ynez Valley above Santa Barbara. But I will always think of Napa and Sonoma when anyone mentions the California Wine Country. This entry was posted in California, My Life and tagged Life, napa, sonoma, St. Helena, wine, wine country on September 3, 2014 by Deborah Drucker.